For smooth development leading to early marketing authorization, a sound regulatory strategy and knowledge of regulatory requirements are key. Zwiers regulatory professionals share their know-how and provide updates on the latest information. Early access, finding new ways to register and including promising markets and therapeutic areas are a few of the interesting topics addressed. Apart from obtaining current and relevant information from us, you will be able to meet with colleagues in the field during this afternoon event and its social part. 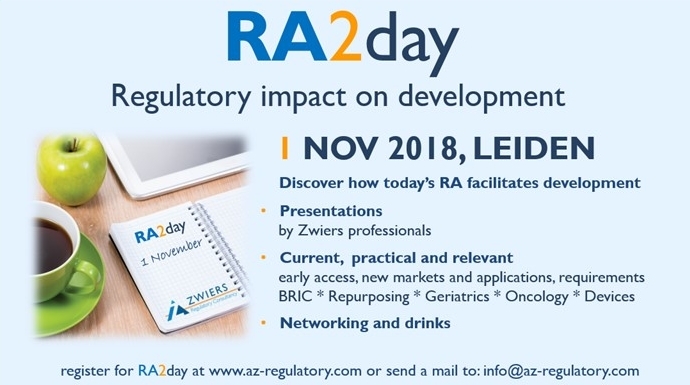 Discover how today’s RA facilitates development: register for RA2Day by sending an email via info@az-regulatory.com.